A collection of contemporary compositions for solo guitar, electronics and chamber works including flute, clarinet and piano. Premiere recordings of works by composers from Italy, Germany and Australia, most of them written specially for the performers. The ‘Three Dances in the Abstract’ are based on my experience as layman in a dance theatre company. I was particularly fascinated by dramaturgical processes that grew out of improvisation. The spontaneous movements and positions of individual dancers led to unexpected interactions, which often resulted in so-called movement choruses. Since antiquity the meaning of 'stoa' also includes a room used for teachings in philosophy and mysticism, where it is possible to contemplate and meditate. The sweet-spots referred to in the title of the work are associated with resonance. This includes such things as the resonance between two instruments playing an octave apart, the resonance between a fundamental and its overtones, and—more metaphorically—the resonance in the case of a warm and sonorous arrangement of simple melodies and harmonies. The idea of sweet-spots refers also to transient resonances as they occur, for example, in a glissando that momentarily duplicates the pitch of a sustained sound. The use of pedal tones is closely linked to the work’s exploration of sweet-spots. The stable pedals, employed throughout the piece, provide the harmonic framework for other sounds to create moments of resonance. I believe that these sweet-spots can appeal to an appreciation of sound in its own right, but also trigger emotional responses because of the warmth and reinforcing qualities associated with them. Gisbert Watty was born in Velbert (Germany). He studied guitar with Maritta Kersting at the Robert Schumann Musikhochschule in Düsseldorf (Germany) and with Flavio Cucchi at the Scuola di Musica di Fiesole in Florence (Italy). Following the completion of his diploma and after participating in Masterclasses with Eliot Fisk, Manuel Barrueco and Oscar Ghiglia, he appeared in numerous concerts throughout Europe and in Australia. His performance activities began in 1990 with a special focus on chamber music and contemporary music. His solo repertoire ranges from J.S.Bach to the present day, including some of the most important concerts for guitar and orchestra (Giuliani, Castelnuovo-Tedesco, Rodrigo, Brouwer). He performs regularly with flautist Luciano Tristaino and his brother the pianist Siegmund Watty, and he is a member of trio altrove 1.3, a chamber group dedicated to music for flute, clarinet and guitar. He has participated in a large number of CD recordings as a soloist, with flautist Luciano Tristaino, the trio altrove 1.3, the Guitar Symphonietta of Florence, the chamber music group of the Italian Youth Orchestra (Orchestra Giovanile Italiana) and the Tuchfühlungsensemble. He has also appeared in radio and television broadcasts for WDR (Germany), RAI (Italy), NRK (Norway), ABC and SBS (Australia). He held masterclasses and workshops in several Conservatories in Italy and Australia and is the guitar teacher in the Music Academies in Campi Bisenzio and Prato. He performed for many years with a guitar made by Gerold Karl Hannabach and presently plays on a ‘Royal’, an instrument made by Paulino Bernabé (Madrid, 2010). 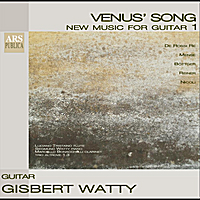 Gisbert Watty is collaborating with numerous composers from all over the world and has commisioned a large number of new works for and with guitar. Luciano Tristaino studied flute with Mario Ancillotti and Rien de Reede. He was a member of the Italian Youth Orchestra and finalist in the 1994 auditions for the Berlin Philarmonic Orchestra at the Karajan Academy. Apart from a busy concert schedule in Italy, Tristaino has also made regular appearances in Switzerland, Germany, Holland, Romania, Hungary, Norway, Australia and the United States, both as a soloist and as a chamber performer. He has recorded and broadcast for RAI, ABC, Bayerischer Rundfunk, RTSO, Koch-Schwan, Arts, Ars Publica and Move Records. Tristaino plays with the Ensemble Nuovo Contrappunto, teaches at the Scuola di Musica di Fiesole and is professor of flute at the Franci Conservatory in Siena, Italy. Marcello Bonacchelli studied clarinet with Michele Del Vicario and Antony Pay. He has won prizes in both national and international competitions and played in many Italian orchestras. Since 1995 he is the clarinettist of the Ensemble Nuovo Contrappunto. Together with the ensemble he has performed all over Italy and in many European countries, recorded several CDs and presented first performances of works by Morricone, Vacchi, Piacentini und Baratelli. He teaches clarinet at the Istituto Musicale “P.Mascagni” in Livorno and in Lucca. Siegmund Watty studied Piano with Hubert Juhre and Till Engel at the Folkwang Musikhochschule in Essen and at the Robert Schumann Institut in Düsseldorf with David Levine. He also attended masterclasses with Aribert Reimann amongst others. Regular performances and concert activities as well as a particular interest in chamber music and contemporary classical music led to engagements across Europe. He has performed at numerous festivals, and recorded for radio and television, including Deutsche Welle, WDR, ABC, RAI and Norwegian Radio NRK. He has also been the artistic director at Tuchfühlung 2 and initiated the Jornadas Hispano-Noruegas in Alfaz del Pi, Spain. trio altrove 1.3 developed from the coming together of three musicians with a special interest in classical and contemporary chamber music. The trio’s first concert took place in 2001 and consisted of a program of first performances of new compositions for this unusual instrumentation. This was followed by a substantial workshop and rehearsal phase that covered some of the most important works of the classical and modern repertoire. The three musicians primarily aim for perfect harmony between sound colour and dynamics, maintaining a precise balance among the three instruments. The trio constantly broadens its repertoire through arrangements of traditional compositions and is constantly engaged in the commissioning of new works from around the world, approaching composers with an interest in the trio’s particular instrumentation and with a willingness to explore new possibilities for chamber music. The results of this work has been presented to audiences in Europe and Australia. Trio altrove 1.3 has recorded radio programms for ABC Classic FM (Australia), Radio New Zealand, Rai Radio 3 and Rai Filodiffusione. In 2007, Move Records (Australia) released the CD Kappa dedicated to new Australian chamber works and the trio has partecipated on the CD Songs e Ricercari with compositions by Fabrizio De Rossi Re (Edizioni Rai Trade).